The green beans were amazing! I honestly thought most of them were going to go to waste so figured I’d better make a kid friendly main and planned to force them to at least try the beans, but I didn’t have to do that at all! I ‘get off’ on seeing the colours, textures and flavours of vegetables that have been blanched! And don’t get me started on the colours and flavours of anything ‘bacony’ being fried up! 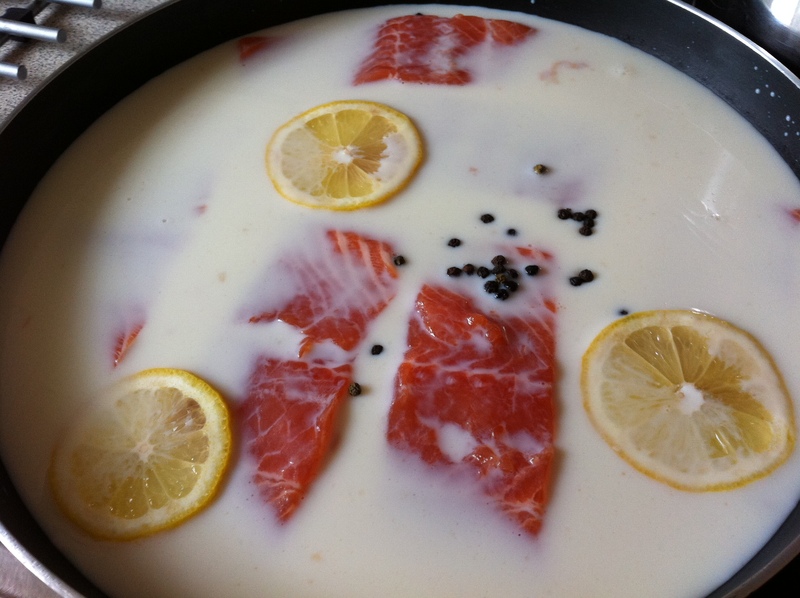 While the potatoes were cooking, I poached the salmon in milk with some lemon slices and a handful of peppercorns. I took scoops of the mixture and formed patties the size of my palm. These were then dipped in flour, eggs and fresh breadcrumbs before being placed in the fridge to chill for 20 mins. Then cook for 20 minutes, turning the patties at half time at 200 degrees celsius! 1. The potatoes – peel, dice and boil until tender. Then drain the potatoes and mash until smooth. Set aside. 2. Salmon – place salmon in frying pan with lemon slices and peppercorns and cover with milk. Place over medium heat and bring to a gentle simmer. When the liquid bubbles, turn heat to low and poach for another 7 minutes. 3. Combine the mashed potatoes, salmon and shallots in a bowl then season with salt and pepper. 4. Take scoops of the mixture and shape balls the size of your palm into fishcake patties. 5. Place the flour, eggs and breadcrumbs into separate bowls and dip each fishcake first into the flour, then the eggs and finally coat in breadcrumbs. 6. 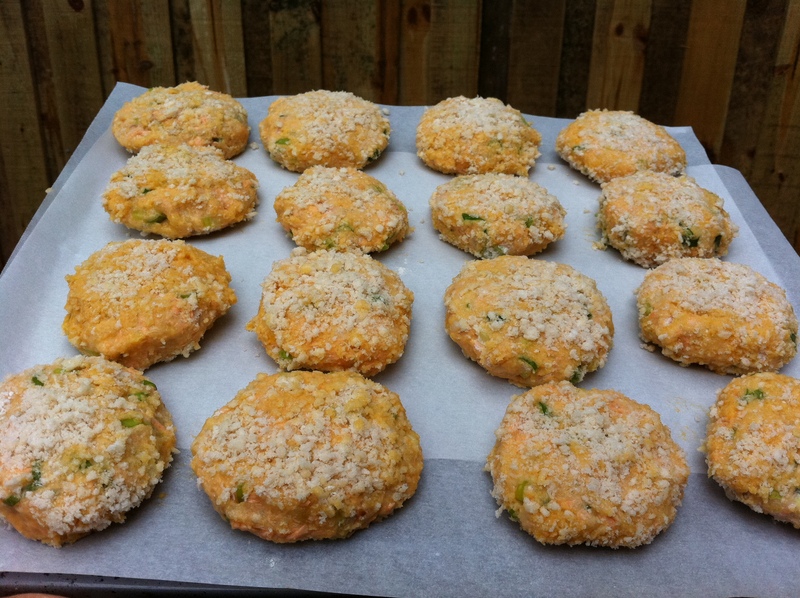 Place the completed fishcakes on a tray or plate and chill in the fridge for 20 mins. 7. Lightly grease an oven tray and bake for 10 minutes on each side or until fishcakes are light and golden. 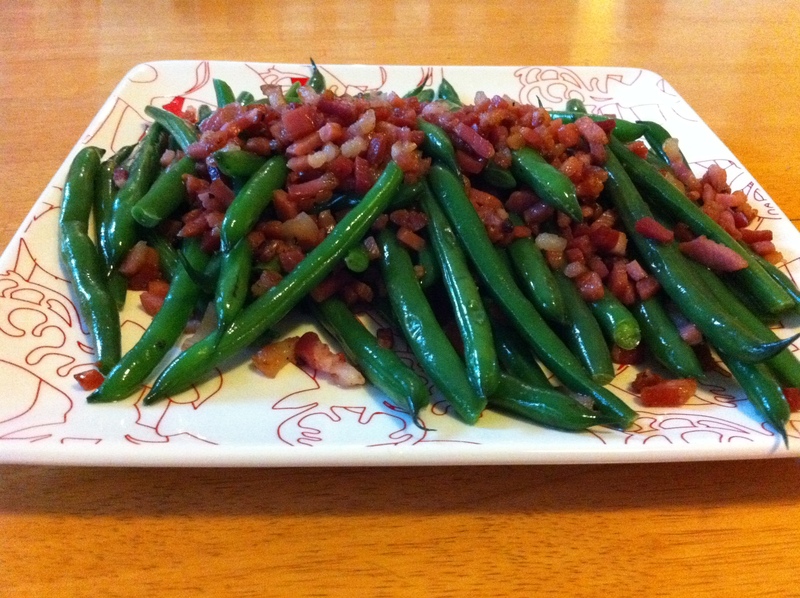 The Pancetta Green Beans came from Dorie Greenspan’s latest book, Around My French Table and were this week’s recipe from French Friday’s With Dorie, click to see a whole variety of takes on this recipe! Tags: baking, cooking, cooking with kids, fish., food, french fridays with dorie, recipes, salmon | Permalink. And I really like your Greek Pork Chops! But you get what I’m trying to say! Dang, those fishcakes look good! Great choice for the beans, I’d say. Thank you! And they really did go soooo well together! I’m laughing at the image of the neighbor dog scratching at the fence! What a delectable plate of beans!!! 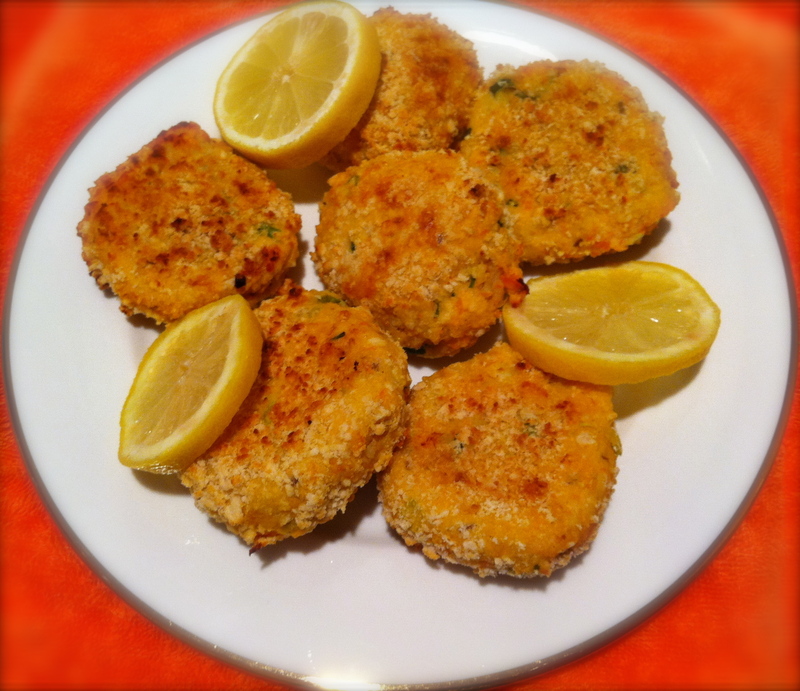 And your salmon cakes sound incredible, too…with Lent approaching, I’m going to try them soon. Never heard him so aggressive at the fence before! It was funny! Those beans look great! Who doesn’t love bacon (or pancetta)? The fish cakes look great too. Nice combo. I know! Bacony stuff rocks! Love the fishcakes! What a great pairing. I am getting hungry! Thank you so much for the idea and details on how to do the salmon cakes. Yours is the 2nd link that used salmon and I thought the first sounded fantastic as well. I am really so excited to try the salmon recipes now because I have 2 teens that love it. And they loved the beans too – just like your house did ! You know you’re on a winner when the kids love it! I agree, the green beans recipe this week was incredible!! 🙂 looks like a great side dish for those fish cakes, yum! Thanks for sharing the salmon cakes recipe! Your beans look beautiful and I’m glad that your kids loved them. Thank you! I was doubtful about how they’d go down with the kids! Pleasantly surprised by their reaction! I’m glad your kids liked this one! 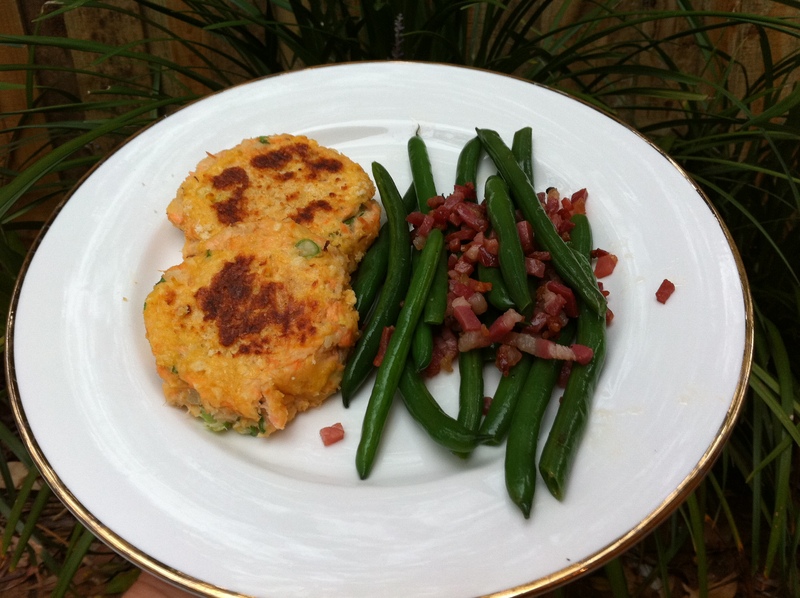 Your salmon cakes look fantastic – and I don’t even like salmon! My daughter’s not keen on salmon either but who can resist anything smothered in potatoes and baked golden brown! Your green beans look so bright! Great color. And, I’m definitely making your salmon fishcakes. I like how you marinate them in milk for a bit. Yes! Poaching the salmon in milk with the lemon filled the house with an amazing smell! I absolutely loved the color and taste of these beans. Yours look fantastic and I bet were a perfect accompaniment to the salmon cakes. 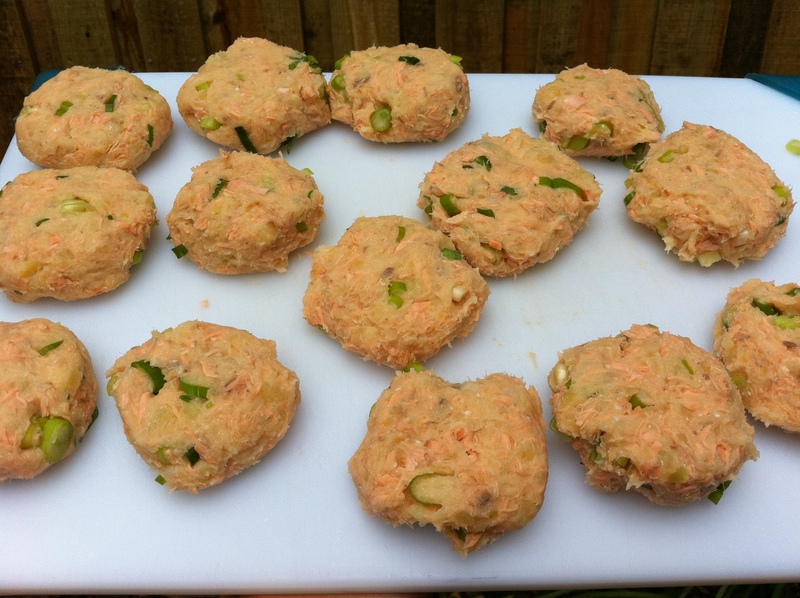 Mmm…I love a good salmon cake! Thank You! I sooo agree with you! Nice post and thanks for sharing the salmon recipe…it looks delish and especially good with these beans. And I love your polenta bread! Thank You! I’m blown away by everyone’s support and encouragement! looks amazing, im going to try the fish cakes. 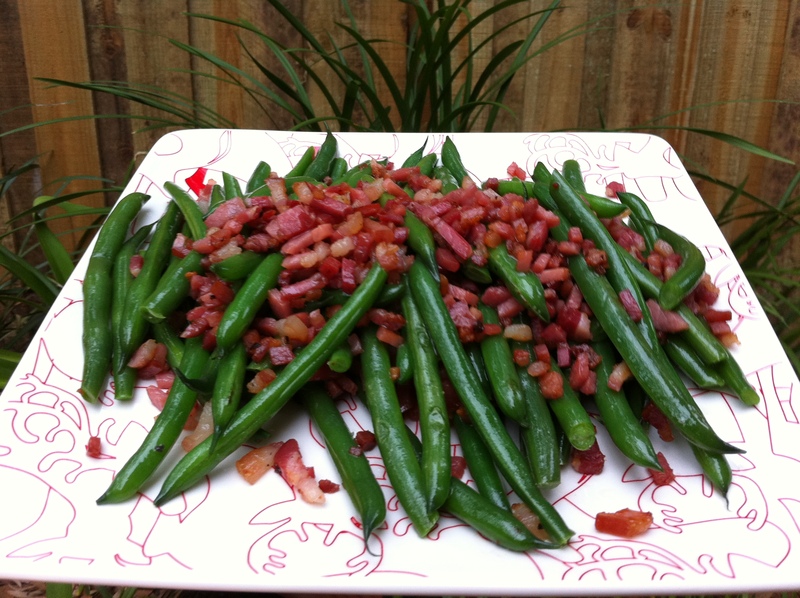 pancetta beans are one of the best things for a barbeque too, mmmm! Thank you! I really enjoyed your blog and I have to say I’m way older and still feel like I’m masquerading as an adult!!! I bet they tasted amazing too! Thank You! And I’m still laughing about your latest post! Very funny! OMG!! Sounds wonderful! May actually have to try it! Great post!! Th beans look amazing- that would be a very nice accompaniment with almost anything! steak and chips and those beans with a nice bottel of red…. right, that’s my weekend sorted! The green beans look great! Thanks for sharing. Thank you and I have to admit this is the first time I baked them and will not go back to frying. I think they taste as good but without the extra fat! I made what we call “salmon patties” yesterday. They are a favorite at my house! That is great! Yummy! My husband would love this, I think I am going to give it a try. That looks amazing. You’ve inspired me to give the salmon cake recipe a try. I have never had pancetta beans. They look amazing. WOW this looks so great! I want to MAKE IT NOW! YUM!!!!! Any fish dish is tasty and healthy IMO! I like the camera shots! Esp the one with salmon seemingly floating in your sauce! Can’t wait to try and kudos on being Pressed Freshly like “EVOO”! The salmon cakes look fabulous! and I don’t think Brangelina is too much…I totally agree. That look yummy. Can you also tell me how you made the beans and bacon to look so good? That looks yummy. Can you also tell me how you made the beans and bacon to look so good? Those fishcakes…yum! I love salmon. Was that an everyday meal. It looks like a meal fit for a king. 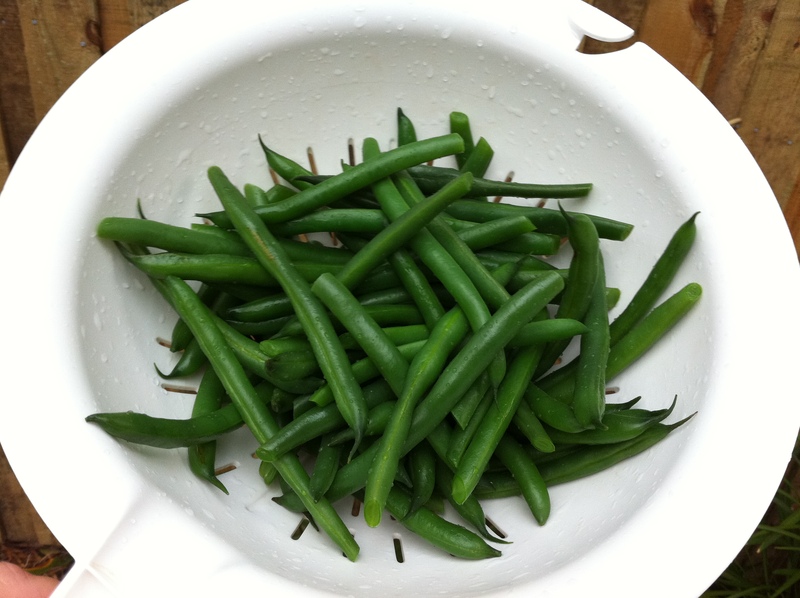 I am very fond of steamed haricot beans and I am glad that it is now possible to get them the whole year round. Yours kids are lucky to have such a lovely momma. Thank you so much! And we are lucky here in Australia, our warmer temps do make most vegetables available year round in decent condition! Wow! Can’t you believe you made them! That’s a huge compliment! Well written Write-up. Glad i am able yo locate a site with some knowledge plus a great writing style. Thank you! I really hope you like them!! !